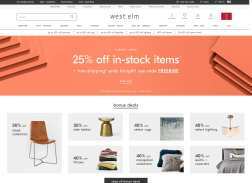 West Elm is an online as well as brick and mortar retailer that sells household wares, kitchenware, bedding, outdoor, lighting, furniture and accessories. Featuring various brands, it also offers discounts and deals on certain items. The store is popular with consumers for its innovative designs. Get 40-50% Off Flannel + Velvet Bedding. Limited Time Only. Get 20% – 30% Off Wall Art. Get 20% Off Your Entire Purchase + Free Shipping. Limited time offer.